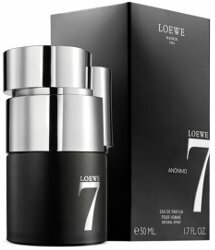 Spanish house Loewe has launched 7 Anónimo, a new fragrance for men. 7 Anónimo is a flanker to 2010's 7 de Loewe. 7 Anónimo features notes of pink pepper, incense, benzoin, vetiver, leather, labdanum and sandalwood. Loewe 7 Anónimo is available in 50 and 100 ml Eau de Parfum. The notes sound nice but I never see this line. No idea where it’s sold. I never see them either, but can be found at the discounters in the US. Ooh, dots connected! I saw the Loews line at the Duty Free shop in Madrid Airport and now it makes sense – it’s a Spanish company! There was a whole carousel display of the line and for the life of me, I couldn’t understand why a movie theater chain (I apparently did not know how it’s spelled – Loews) would venture into perfumes. None of the perfumes I smelled compelled me to look further into the brand. Mystery solved! The notes on this one sound good. And 1 more E — Loewe. The original 7 smelled (maybe still does) like incense leaves, not the burnt incense.